Leinster extended their lead over Munster at the top of the Pro12 table to five points thanks to a comeback win over their Irish rivals in Dublin. Munster took a 12-6 lead into the half-time break thanks to four penalties by Ian Keatley to two by Ian Madigan. Brian O'Driscoll scored the only try of the game in the second half to put Leinster ahead for the first time. Madigan converted and kicked three second-half penalties, with Keatley adding two more penalties for Munster. 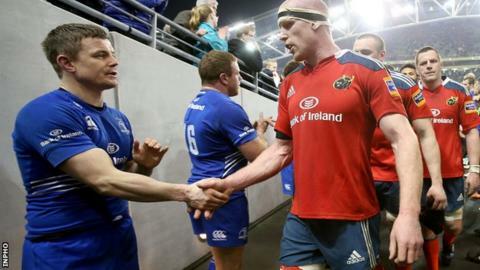 The Irish inter-provincial game was initially going Munster's way until Leinster turned things around, with Shane Jennings putting O'Driscoll over for the decisive 57th-minute try while Munster prop David Kilcoyne was in the sin-bin. Keatley's fifth and sixth penalties of an unblemished night with the boot set up a frantic finish at 19-18, but a 79th-minute kick from Madigan made certain of the home win. The visitors had opened up a 9-0 lead by the 22nd minute with two of Keatley's opening three penalties coming from Munster's assertive scrum. Two Madigan kicks closed the gap to six points by the interval, before O'Driscoll and man-of-the-match Jamie Heaslip drove Leinster to a hard-earned comeback victory. The injuries were not just confined to the players as French referee Pascal Gauzere had to be replaced during the week by Ireland's own Alain Rolland, the ex-Leinster scrum half, who is retiring from refereeing at the end of the season. A typically robust opening saw blood falling from a wound on Paul O'Connell's face within two minutes. Before temporarily departing, he helped Munster win a scrum penalty and Keatley's close-range kick put them ahead. A second successful penalty followed from inside the 22, rewarding half-breaks from Simon Zebo and Tommy O'Donnell as Munster's positive start continued. There were glimpses of O'Driscoll's brilliant sleight of hand, but some 'industrial language' from the veteran centre also earned him a talking to from Rolland. Although Leinster improved approaching the midpoint of the half, Munster's scrum was becoming a weapon with a strong shove near the 10-metre line setting Keatley up for his best strike of the night. Madigan snapped back three points with a difficult penalty from the left, before Kilcoyne forced another scrum penalty out of Mike Ross and Keatley's kick split the posts. Leinster increased the tempo in sight of half-time, Luke Fitzgerald chasing down an O'Driscoll dink over the top and the resulting five-metre scrum - Ross getting the call this time - saw Madigan half Munster's lead. The Leinster fly-half, who missed a kickable chance in injury-time, quickly got his side off the mark in the second half - his half-back partner Eoin Reddan's break doing the initial damage. The penalty count against Munster increased with David Foley singled out for not rolling away. Madigan mopped up with the points to bring Leinster level at 12-12. The pressure increased on Munster when Kilcoyne was sin-binned for the same offence as Foley's, with Leinster beginning to build momentum in and around the 22. They moved ahead for the first time when the increasingly influential Jennings took the ball up and his offload out of the tackle sent O'Driscoll scampering over from a few metres out. Madigan converted for a 19-12 scoreline, but 14-man Munster countered superbly with CJ Stander spearheading a drive for a left corner. They came away with an important three points converted by Keatley. O'Driscoll's night was ended by injury past the hour mark and the Leinster defence had to withstand some energetic running from the likes of Zebo, Keith Earls and speedy replacement Gerhard van den Heever. Munster kept pressing and Ross's high tackle on Stander gleaned them another three points from Keatley, before a crossing call against O'Donnell allowed Madigan close out Leinster's 10th straight win. Leinster: Rob Kearney; Fergus McFadden, Brian O'Driscoll, Gordon D'Arcy, Luke Fitzgerald; Ian Madigan, Eoin Reddan; Michael Bent, Richardt Strauss, Mike Ross; Devin Toner, Mike McCarthy; Kevin McLaughlin, Shane Jennings, Jamie Heaslip. Replacements: Sean Cronin for Strauss (65), Jack O'Connell for Ross (77), Leo Cullen for McCarthy (65), Jordi Murphy for McLaughlin (68), Zane Kirchner for O'Driscoll (67). Not used: Ed Byrne, Isaac Boss, Jimmy Gopperth. Munster: Felix Jones; Keith Earls, Casey Laulala, Denis Hurley, Simon Zebo; Ian Keatley, Conor Murray; Dave Kilcoyne, Damien Varley, BJ Botha; Dave Foley, Paul O' Connell; CJ Stander, Tommy O'Donnell, James Coughlan. Replacements: Duncan Casey for Varley (59), James Cronin for O'Donnell (55), Donncha O'Callaghan for D Foley (65), JJ Hanrahan for D Hurley (67), Gerhard van den Heever for Jones (65).